Sadly we have reached the final day of our 7-night cruise. 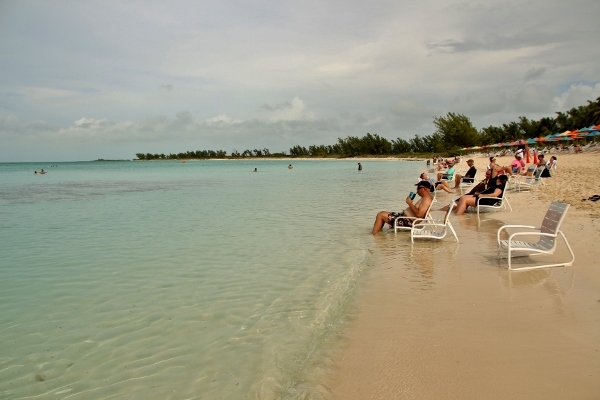 On the bright side, it's arguably everyone's favorite port of call, Castaway Cay, Disney's private island in the Bahamas. 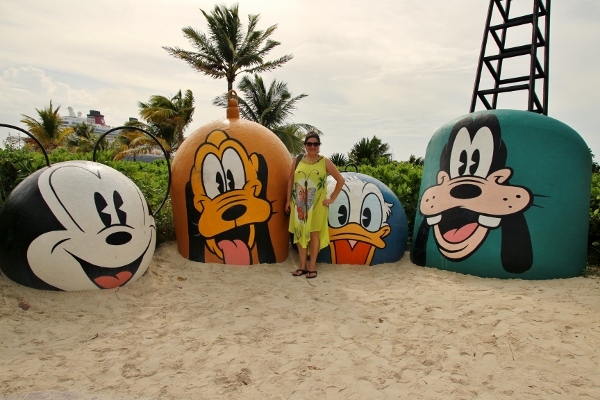 This was my sixth visit to Castaway Cay. The only cruise I've done that skipped this port of call was the Southern Caribbean out of San Juan. 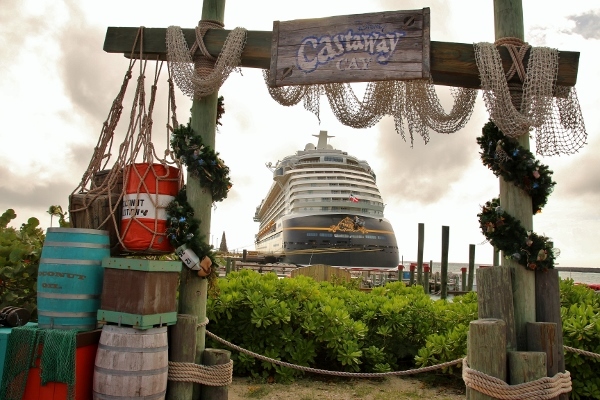 There are not enough words to express how much we love Castaway Cay, but I will try. 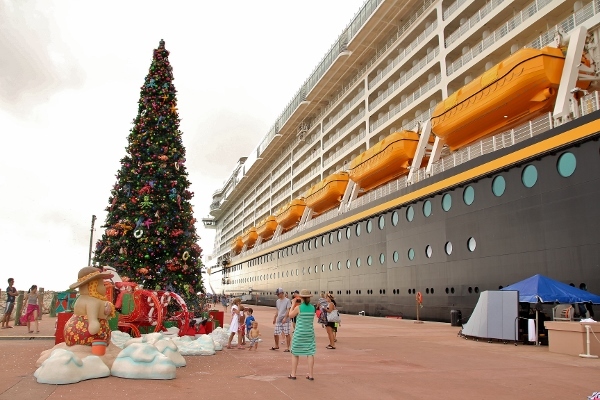 It's pretty much the ultimate happy place for any Disney Cruise Line lover. 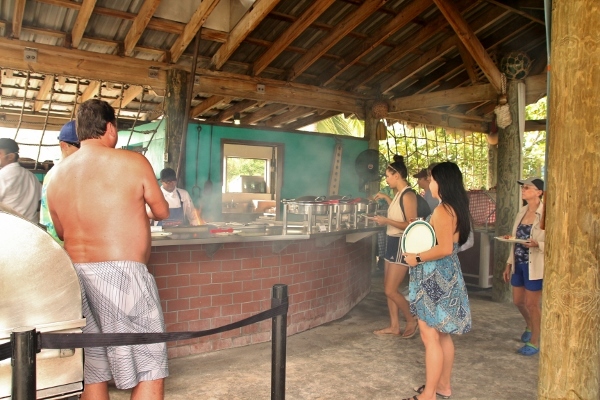 Comprised of a family beach and an adult-only beach (Serenity Bay), waterslides (Pelican Plunge), a snorkeling lagoon, water sports, food, drinks, and more. 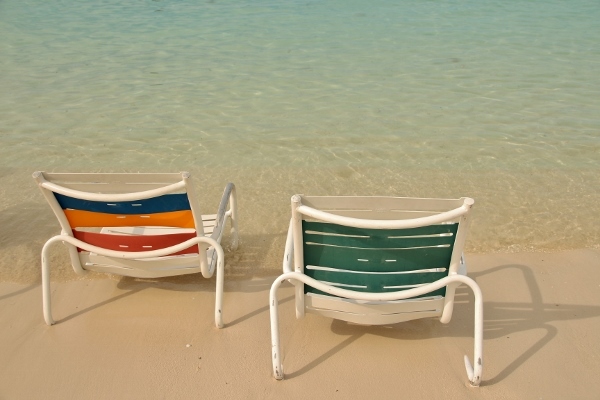 The sand is powdery white and the water is turquoise blue and crystal clear. 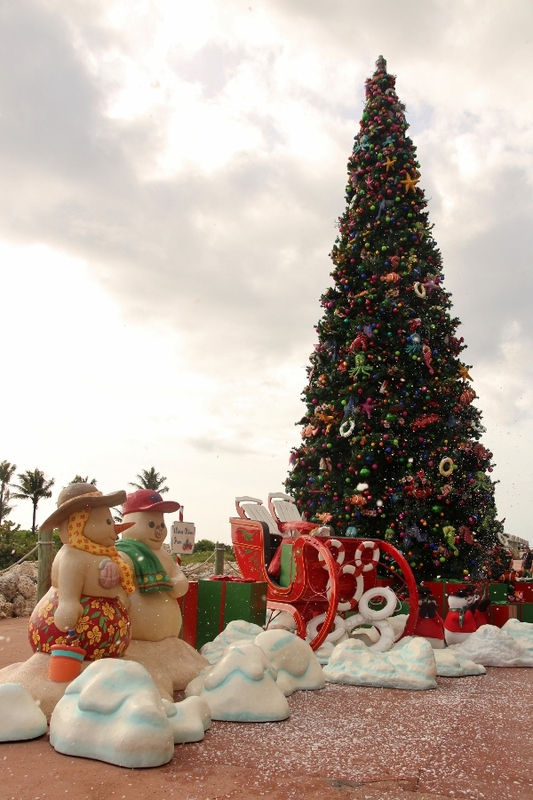 As this was our first Very Merrytime cruise, this was the first time we experienced Castaway Cay decked out for the holidays, and oh my goodness, it was seriously extraordinary. 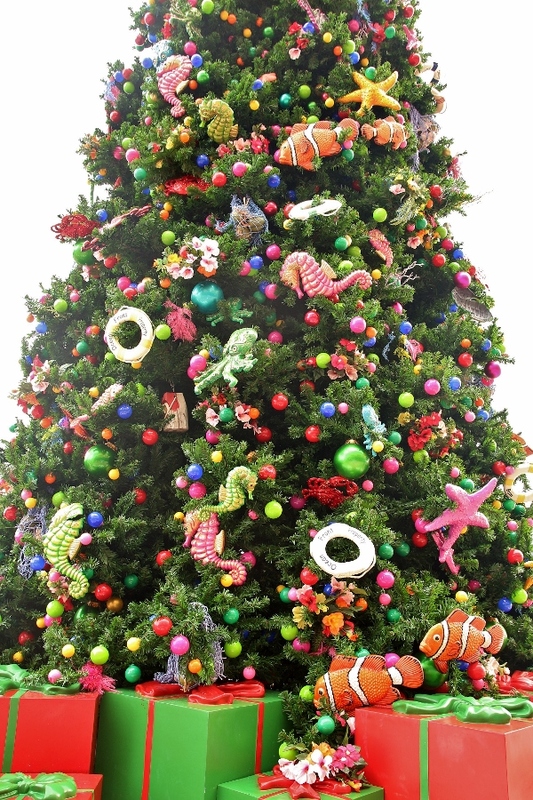 The Christmas tree alone was a perfect mashup of Caribbean flair and Christmas comfort. 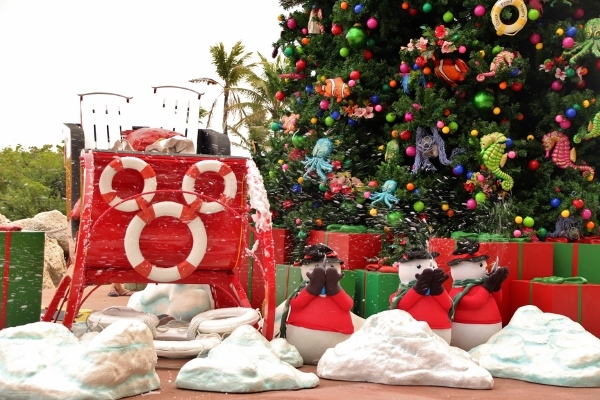 In place of snowmen we had sand-people, and a snow machine blew artificial snow into the air by Santa's nautical-inspired sleigh. 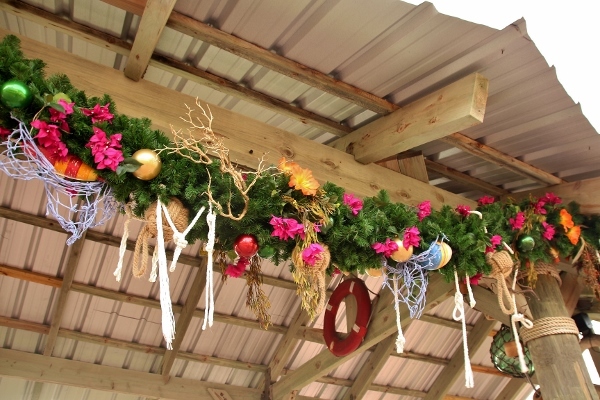 Garlands strung across the tram-depot featured knotted boat ropes. 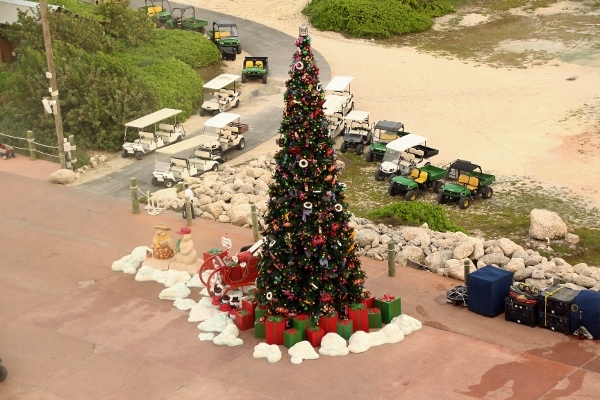 The weather at Castaway Cay can be temperamental. Years ago we nearly couldn't dock because of the high winds and surf. This visit we had no problems docking, but due to higher than usual winds all of the port excursions were cancelled, and the water at the family beaches was pretty choppy. 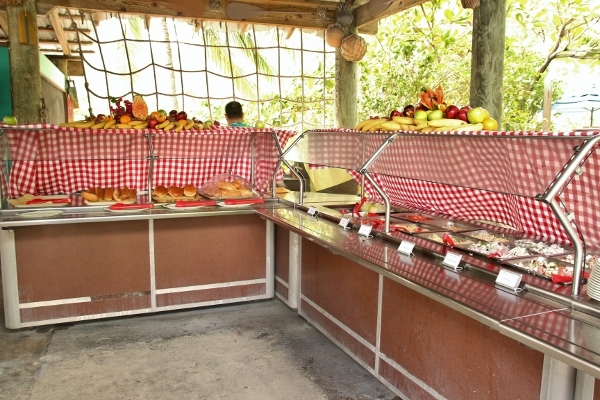 There are a few spots to eat lunch at Castaway Cay: Cookies BBQ at Scuttle's Cove, Cookies Too BBQ at Pelican Point, and the Serenity Bay BBQ area (photos below), which is identical to the others, menu-wise, but also features a couple extra items like grilled rib-eye steaks, and some cold soups, like gazpacho. Because Serenity Bay, the adults only beach, is on a different side of the island, we were well-protected from the wind, and it was almost like we were on a different island altogether! The water was absolutely calm and clear. 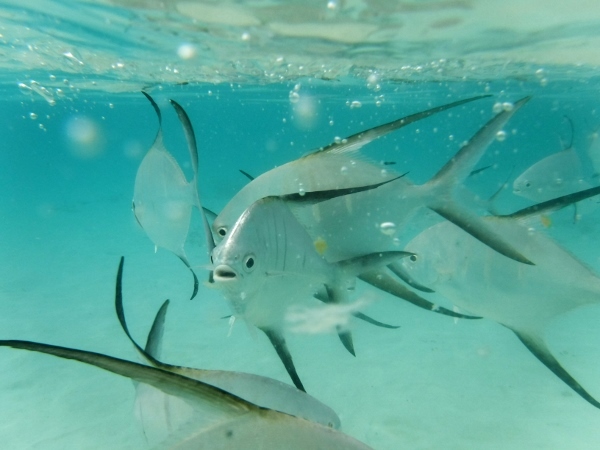 A school of fish swam all around us, and even had a bit of a feeding frenzy when another guest fed them some bread! We also saw a large blue-ish looking stingray (not sure exactly what kind it was) and stalked it down the length of the beach. This was definitely one of the highlights of the entire day. 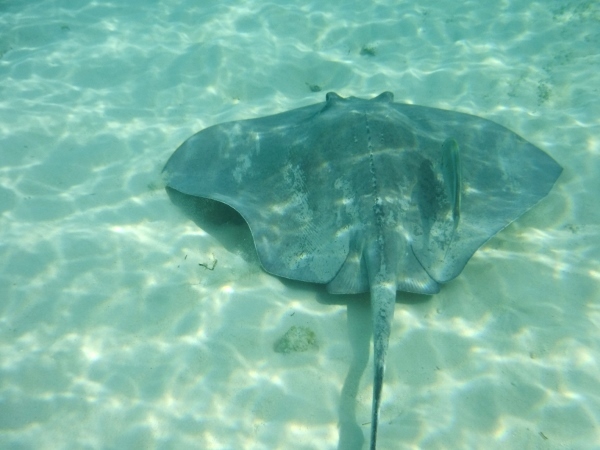 We have snorkeled with stingrays both at Castaway Cay years ago for an excursion, and also at Discovery Cove in Orlando, FL, but this was our first time seeing a stingray truly in the wild! 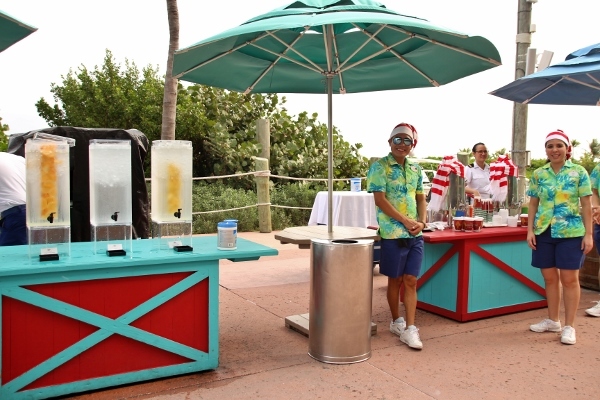 A day in the sun at Castaway Cay wouldn't be the same without one of our traditions, a beach side Konk Kooler. 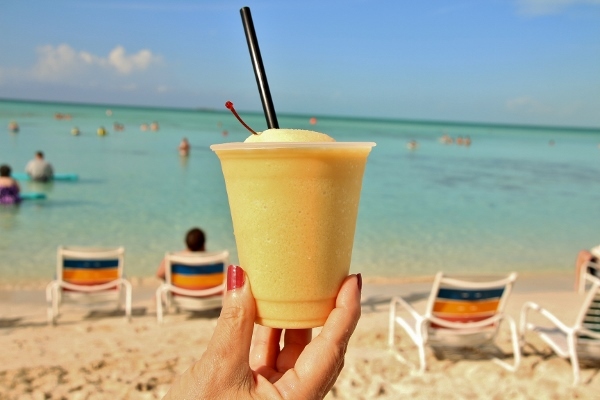 This Disney Cruise Line exclusive cocktail is a mixture of light and dark rums, orange and passion fruit juices, and cream of coconut all blended with ice. Dragging ourselves away from Serenity Bay is next to impossible, but we managed to head back to the ship with some time to spare. 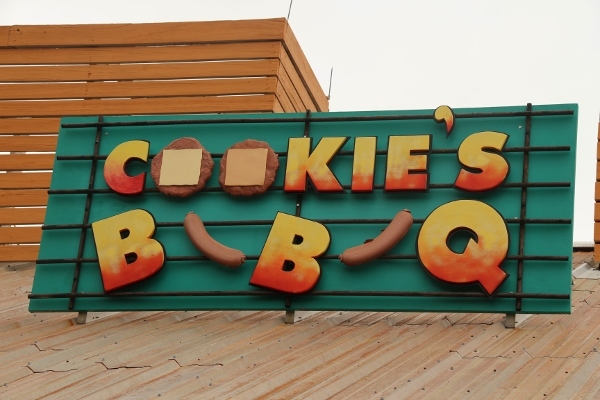 In addition to the usual infused waters, Cast Members were also serving up hot chocolate and Christmas cookies for guests returning to the ship! 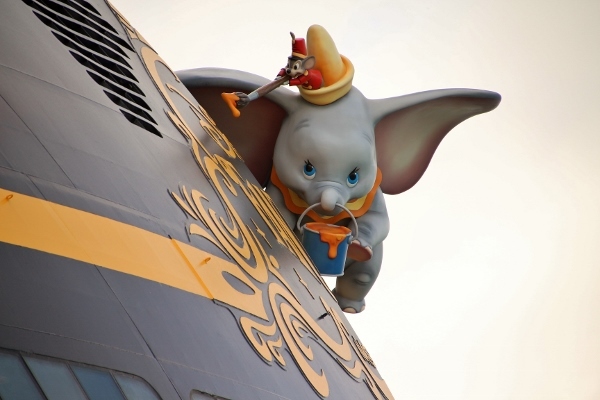 Here's a final look around before boarding the ship one last time. Back in our room, we said goodbye to Castaway Cay out of our porthole. I nearly cried when the Cast Members sent us off with a wave with their matching Mickey Mouse gloves, and a synchronized bow as they said farewell. 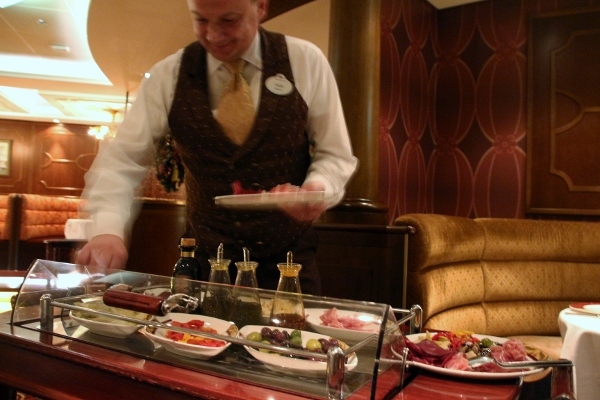 In honor of our last night aboard, we had made reservations at Palo, one of two adult-only specialty restaurants on the Disney Fantasy. 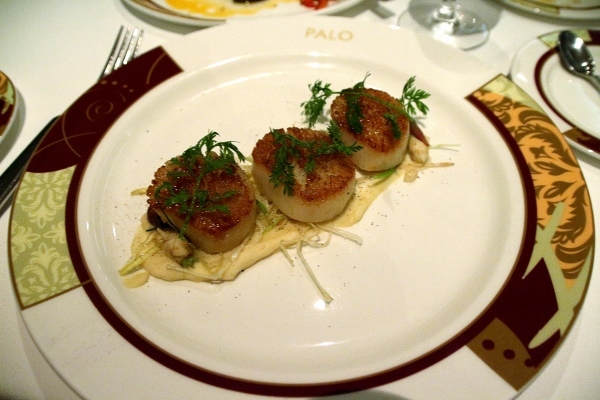 Palo is inspired by Venetian decor, while the other restaurant Remy is a nod to the little chef by the same name. 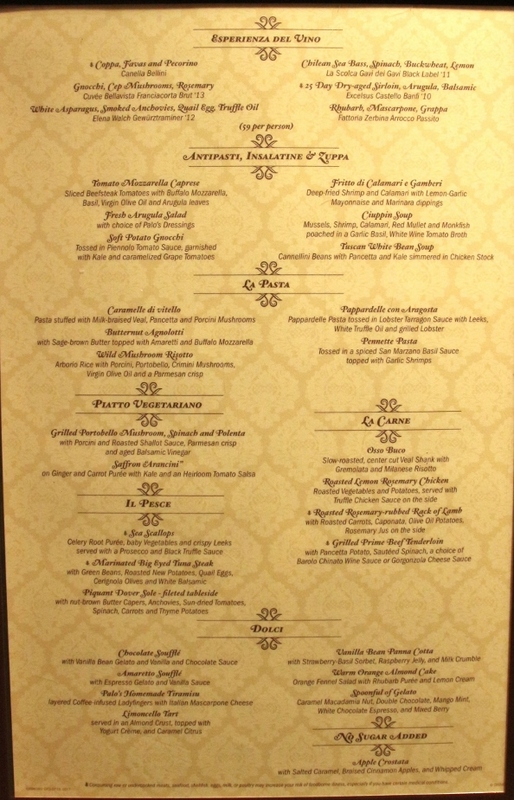 While both offer very different dining experiences with vastly different price points, they both feature both brunch and dinner. 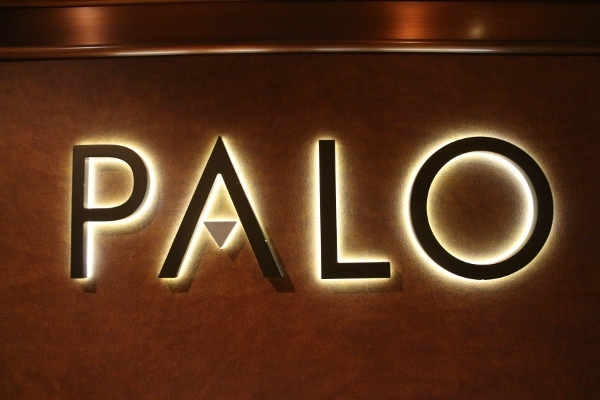 We decided this time around to do dinner at Palo. Full disclosure, I struggled to get good photos at this meal as our table was in a particularly dimly lit portion of the dining room. 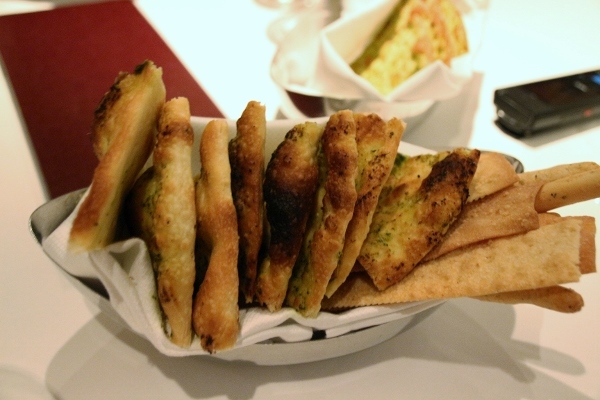 Per usual, our meal started with a selection of freshly baked breads and a tableside antipasti service by our server. 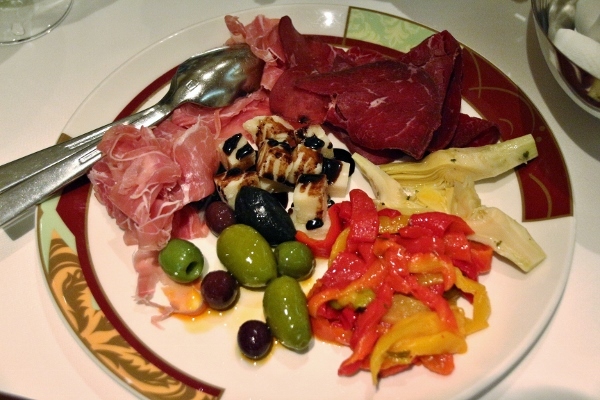 We absolutely love the antipasti at Palo, which features prosciutto, bresaola, Parmigiano-Reggiano (aged 12 months), marinated olives, artichokes, and roasted bell peppers all drizzled with your choice of infused extra-virgin olive oil (either thyme, chili, or rosemary--our server drizzled all three) and balsamic vinegar (aged 8 years). 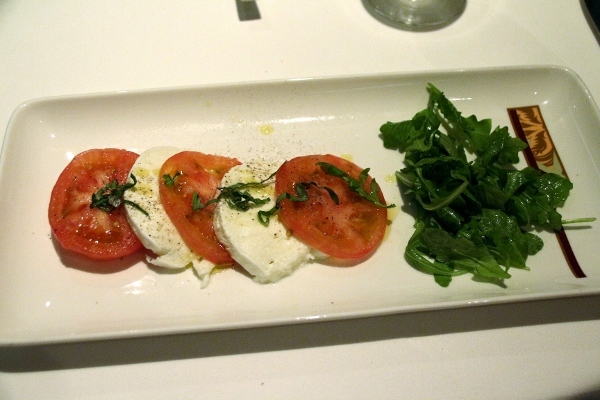 A popular starter at our table was the Tomato Mozzarella Caprese, truly a classic. 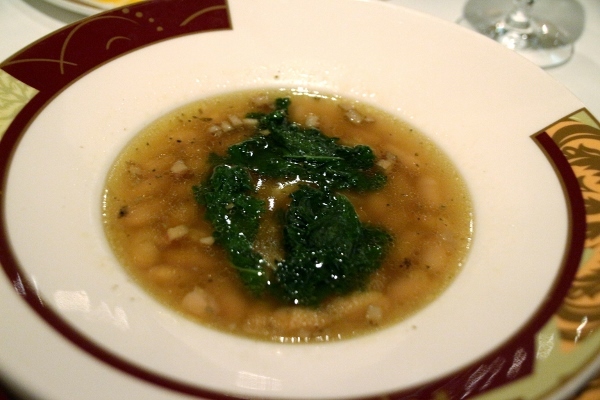 Several of us also ordered the Tuscan White Bean Soup. Previously, this was a pureed bean soup, but now features whole beans in chicken stock with pancetta and kale. Our server raved about the new version of the soup, but honestly I preferred the old pureed variation. 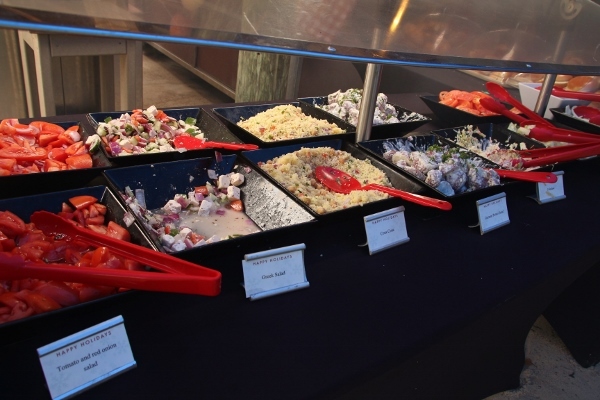 This was comforting, but lacked seasoning for all of us. 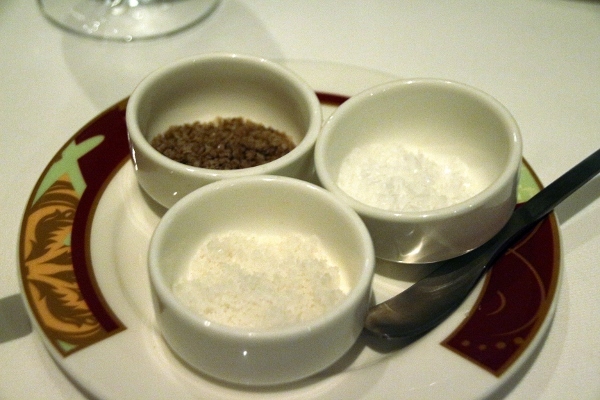 When asked for salt we were offered a selection of three salts including a smoked salt, but I do wish it would have been better seasoned in the first place. My brother-in-law made an excellent pick for one of his starters, and was nice enough to let me try one! 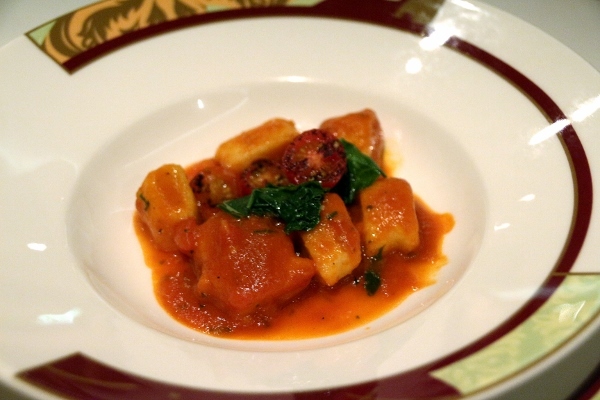 This Soft Potato Gnocchi was tossed in Piennolo tomato sauce from Italy, and garnished with kale and caramelized grape tomatoes. 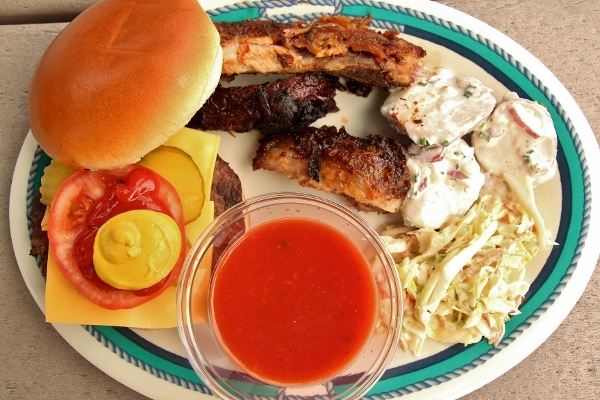 It was incredibly tender and the sauce was just luscious. 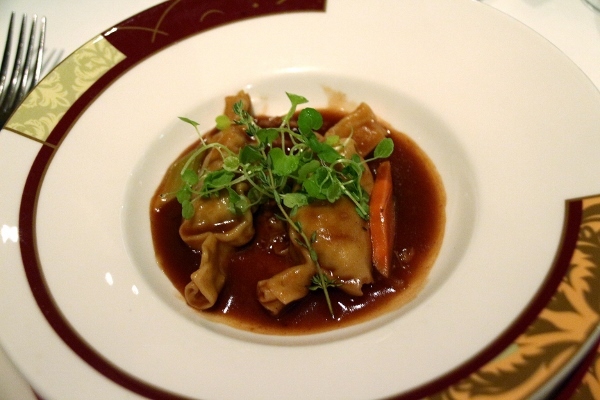 I asked for a small portion of the Caramelle di Vitello off the pasta menu. It's a pasta stuffed with milk-braised veal, pancetta, and porcini mushrooms. It was incredible. The "small portion" came with two candy-wrapped pastas, while the regular portion my sister got for her entree was only three, so not a huge difference in size, but totally worth ordering either way! 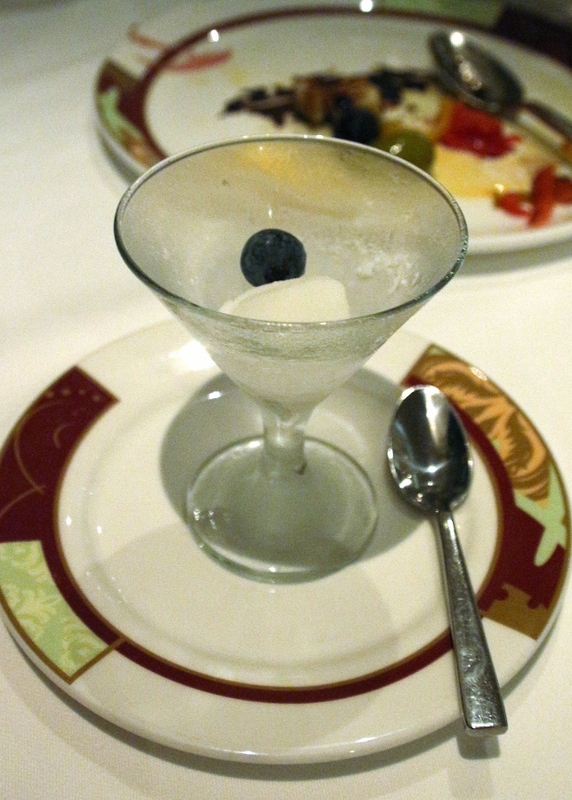 At this point we were served a small portion of sorbet as an intermezzo to cleanse our palates before the main course. 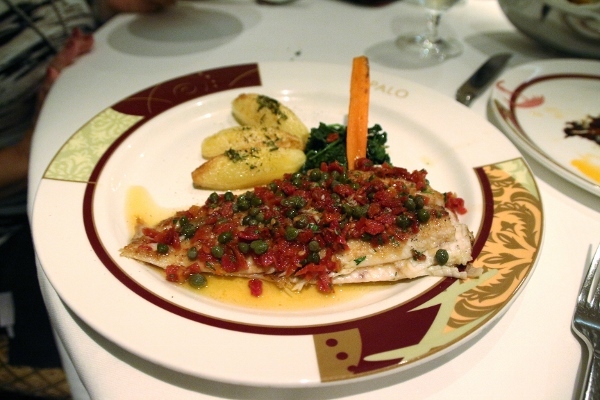 My mom ordered the most entertaining entree out of all of us, the Piquant Dover Sole which is filleted tableside. It features capers, anchovies, sun-dried tomatoes, spinach, carrots, and thyme potatoes. 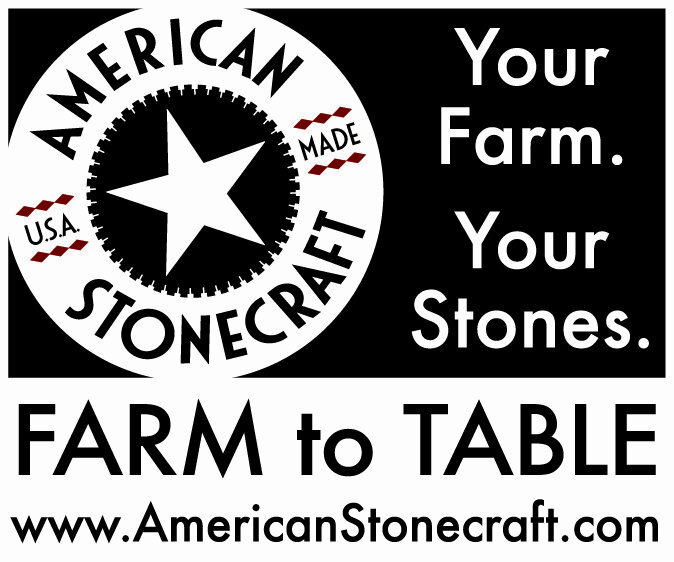 Here's a video of our server in action! 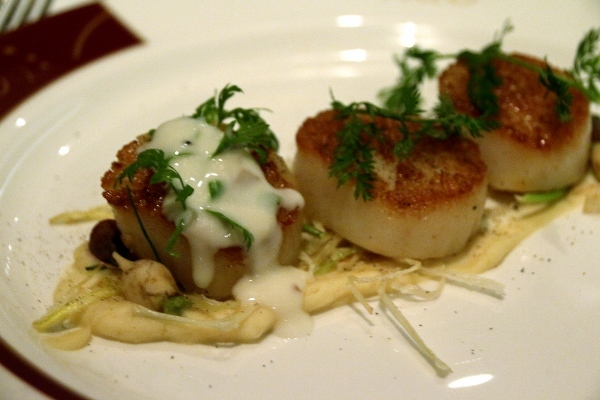 I selected the Sea Scallops which were served over celery root puree with baby vegetables, crispy leeks, and a Prosecco and black truffle sauce on the side. I was pretty stuffed at this point, but really loved my entree (or as much of it as I could finish). The scallops were perfectly cooked, and the baby vegetables were by far the smallest baby vegetables I've ever seen. So adorable! 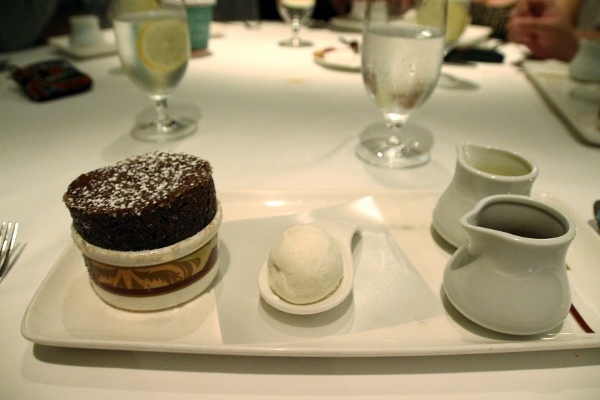 For dessert the most popular option is the famous Palo Chocolate Souffle with vanilla bean gelato and vanilla and chocolate sauces. 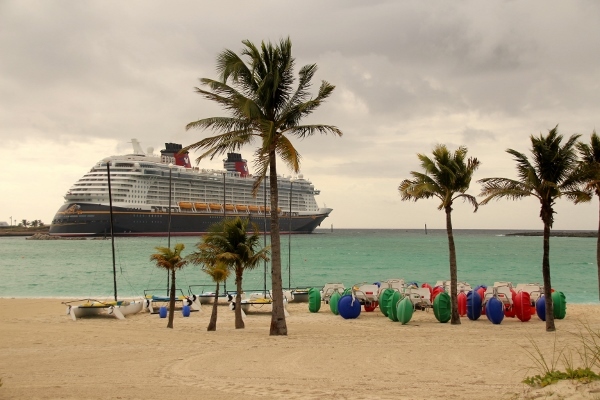 It's dream-worthy and reason enough to book a reservation at Palo for your next Disney Cruise. Although I couldn't NOT order a chocolate souffle at Palo, we were excited to see another souffle had been added to the menu, and several other family members decided to try it. 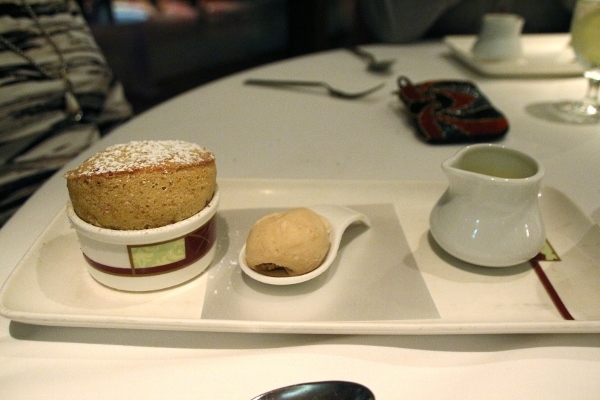 This Amaretto Souffle is served with espresso gelato and vanilla sauce. If you like amaretto, then you will love this souffle! It's decadent and absolutely fantastic. I will be hard-pressed to pick which souffle to order next time! 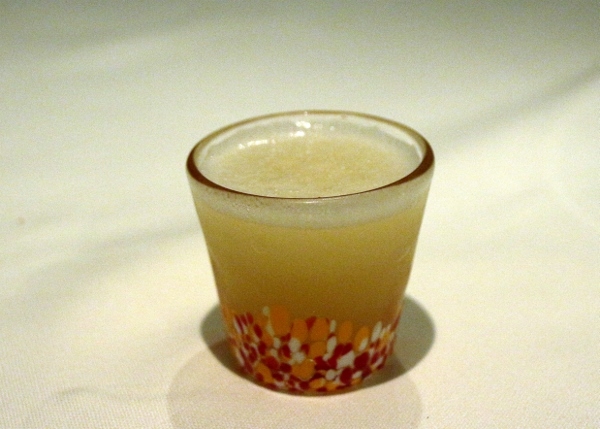 The final touch at Palo dinner is a shot glass of Venetian sgroppino, a combination of lemon sorbet, Prosecco, and at Palo a splash of Calvados (apple brandy). It's a sweet, tart, and boozy finish to what is consistently a wonderful meal. It's been a really magical trip down memory lane sharing my experiences from my recent Very Merrytime Western Caribbean Cruise. Although our cruise plans were turned upside down because of hurricanes that came and went months ago, our trip turned out even better than we had hoped. Although we still prefer Eastern Caribbean itineraries, I have to say this Western really won me over! I would happily visit any of these ports of call again. 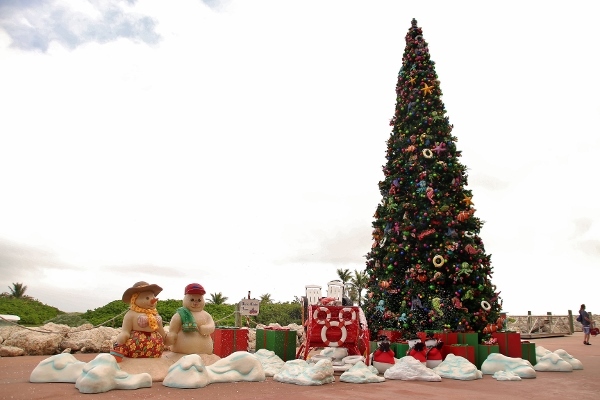 All in all this was a wonderful week aboard our favorite Disney Cruise Line ship. Thank you so much for joining me on this journey. It's been a pleasure sharing these wonderful memories with you all.